After going out of print a few years ago Railroad Tycoon was reincarnated in 2009 as Railroads of the World. Both nearly identical versions were designed by Martin Wallace and Glenn Drover. And I must say I like R.T. quite a bit more than Wallace’s “Perikles“. Yes, it’s over-produced and originally from Eagle Games, but apparently, this time, they play-tested a design before publishing it. What a concept! The game comes with a large hex grid map of eastern North America. On it you will find urban areas, small city sites, rivers and mountains. Each large city is color-coded and starts with a limited number of colored cubes. The color of the city is the type of goods it will buy and the cubes are the goods that can be shipped from it. Each player begins with a railroad tycoon/secret mission card but no money or stock certificates. While there are cards in this game it’s not a CDG. 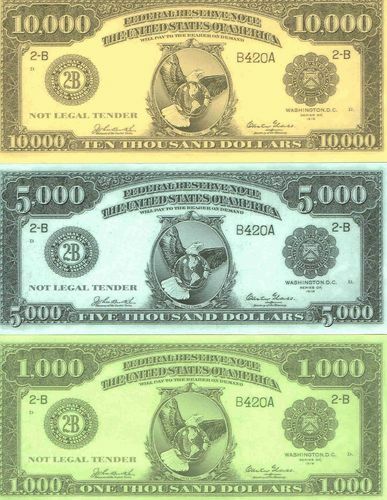 Now, although you can issue all the shares you want, that is, obtain all the money you want, you’ll have to pay dividends for the stock you sold. So if you issue a blizzard’s worth of stock without putting the resulting money to good use you’ll end up owing more in dividend payments than you’ll be making in freight charges. 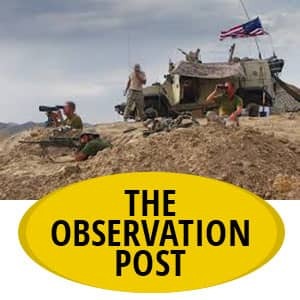 And, of course, the only way to make up the balance would then be to issue even more stock, but that will put you even further behind the curve the next time these bills come due. 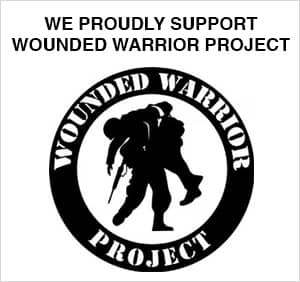 And, don’t forget, every share you sell will eventually cost you a Victory Point. So now that you’ve got money burning a hole in your pocket what do you do with it? Well, you could upgrade your locomotive or expand your trackage or urbanize a small city along your route, which is the only way you can generate more cubes or you could obtain event cards. But, remember, your company only makes money by delivering colored cubes to a similarly colored city. (And the farther you ship these cubes the more money you make.) But you can only do three things a turn, so the more you build, the less you ship and, conversely, the more you ship, the less you build. Now, this is not a card driven game in the usual sense of the term as you can play it without even reading the cards. But while you can play it this way, you can’t win it this way. 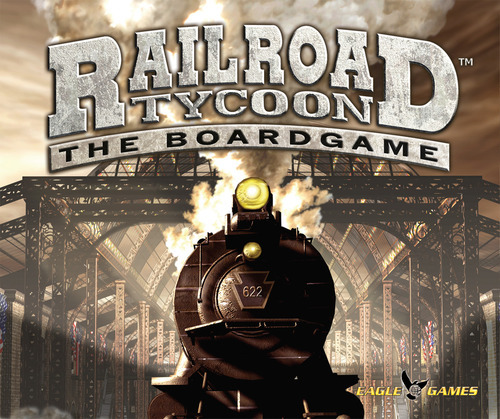 In any case, Railroad Tycoon is a long game and a highly produced one, with all sorts of little colored bits. 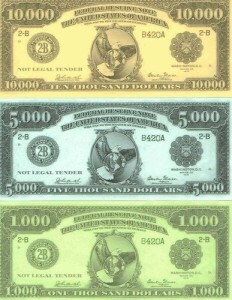 It comes with hex shaped track tiles used to connect cities, variously colored cubes, plastic engines, which are used to label track ownership, colored city tiles (in order to upgrade small towns into urban areas), paper money, stock certificate, various plastic buildings used to signify that a city has run out of goods to ship, plus tycoon, random event and mission cards. So there is a lot going on. The game ends when a certain number of cities run dry of cubes. 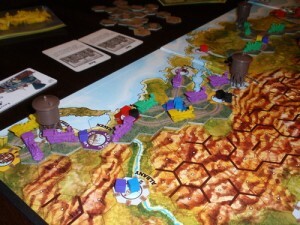 In the 4 player version we use the game ends when 14 cities are played out, which could take anywhere from 3 to 4 hours. The winner is the player with the most Victory Points and that’s measured by how much income was generated plus the value of any cards possessed minus the number of shares issued. However, R.T. is a Euro style game, so there is not that much player interaction. Just about the most you can do to slow down your opponent is to get to the cities he needs first and ship out the colored cubes he specialized in before he gets there. Of course, you can also out bid him for the honor of going first. But that’s not that big a deal if you let him get too far ahead of you in the first place, so careful play is called for. The large brown figures signify that a particlar city is now out of blocks to ship out. When a certain number of cities empty out the game ends. For example, in a 4 player game it takes 14 empty cities to end a game. But don’t let me over-hype this game: its rules need work. For example, players get a major boost in Victory Points and income for being the first to “connect,” say, New York and Chicago. But what exactly does “connect” mean? Well it means you built your own line the whole way, not that you get away with building the last few miles of someone else’s effort. But you have to search the web to find this out. And that isn’t the only vague patch in the rules. For instance, there is also a card that allows you to get some new track without paying for it and its use “is not an action.” Well, does that really mean the placement of track can have no costs in time or money? If so, a player can have a “double segment” by placing down free tracks and then taking a normal move right after it. But that makes this card way more powerful than any other card. So the vagueness of the rules will annoy new players. 1. Permanent Major Lines. All the Major Line cards are permanently available to all players…. 2. 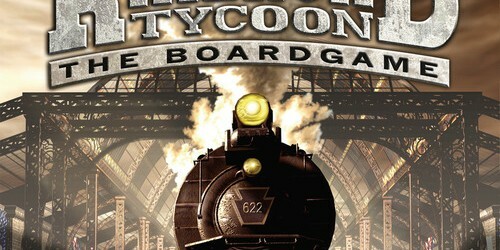 To start players choose from one of two Railroad Tycoon cards. 3. Cost of any water hex is $3000. 4. Shares can only be taken to get money for immediate use. (So you can’t buy a win). 6. Add two new hexes… Add a hex between New York and New Haven, and …. New Orleans towards Mobile. While most people recommend playing with them all, we aren’t using # 3 and # 5 for now ourselves. The first, second and sixth modifications are especially important. As it is only with the Major Lines cards always activated that there really is a point to working on building the longer routes. Plus the two added hexes modification (# 6) repairs an important flaw in the map’s design. As for taking your pick of either of two Railroad Tycoon cards (# 2) this allows another section of the rules actually to impact play, something that didn’t always happen in the original. It’s also true this game is a Euro, so the runaway leader problem has to be watched for, although it really doesn’t have to be that much of a problem if you are careful, as the designers took the trouble to work against this tendency. 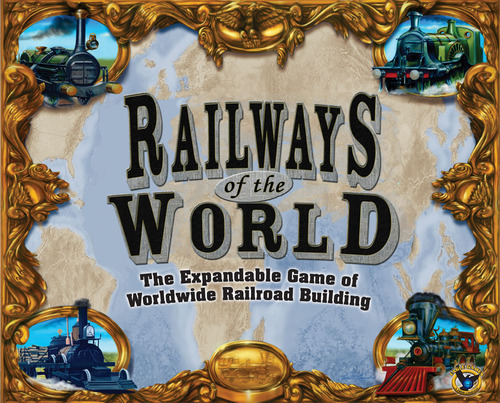 Therefore, if you like train games and especially if you are looking for a family game or a game that will appeal to a wider range of players, give it a try. It has some depth and its worth replaying. And that has to count for something.